Hello and welcome back! I am SO excited about todays blog post, I mean I even posted on my Story yesterday about how excited I was/am so that means something right? Basically I have created this super fun bunny nail art look and I am slightly obsessed with it. 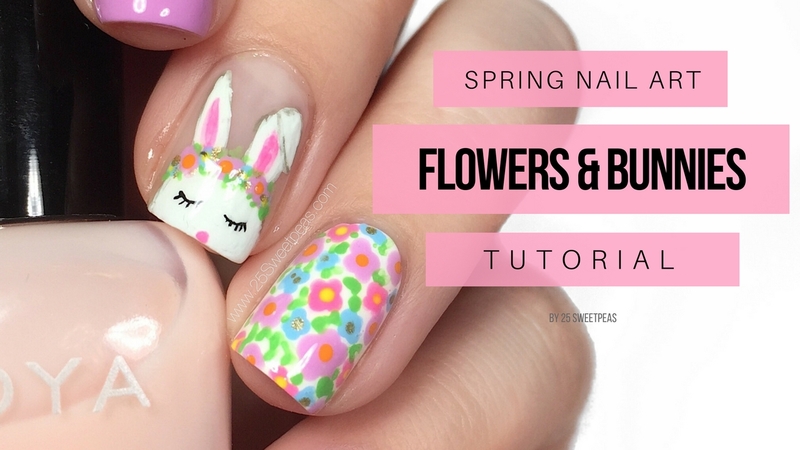 Its perfect for any bunny lovers, spring lovers, or anyone looking for a cute Easter mani! Also in my video I have broken it into two parts so if you want to know how to do the bunny you can but if you want just the floral you can do that too! So many options, so lets go! Ok quick video guide - If you want to see the bunny start at the beginning, if you want just the floral skip to about 2:55! You can easily just wear the bunny as an accent or just the floral as an accent or the floral on all! Its actually a simple floral believe it or not! So be sure to watch the video! Then the bunny I talk through a few options in the video too. You could do both ears up and not worry about the "fold" or outline! PLUS if you didn't like the flower crown you could easily leave that off or trade it out for a bow, see there are just so many options, but I am obsessed with animals and flower crowns lol! So for this look I used the below products! I had SOO much fun creating these. I was watching the new Jumanji and the idea came to me to do a bunny look my Unicorn look. Why did that randomly come to mind while watching the movie I don't know, but it did! LOL! See inspiration can really strike at any time! On another note, the movie was really good! Anywhoo back to the nails, as soon as the movie was over I ran to go paint this look. This is adorable Sarah! This reminds me of the unicorn you did too! Your bunny is so cute! I love this look for spring! Both the bunny and the flowers are cute but I like the flowers best. Love your color choices! Oh my gosh, this is SO cute!! Everything about this manicure is wonderful. I'm loving the bunny and the flowers plus the China Glaze is perfect for the design. I saw this on IG and it's about the darned cutest thing I've ever seen. Well done!! This is adorable! You are so talented at freehand manicures! this is so cute!!! I haven't done any easter nails this year. Oh these are so adorable, and the colours are perfect for Spring. Love! I definitely want to try those flowers as an accent nail! I need to try this and make the bunny an Bunnycorn! Your bunny is freaking amazing, I love how his little ear is folded over. This design is just super adorable! Oh my, these are so stinking cute!! The little flower crown on the bunny is so adorable! I love the bunny and flowers together! Very pretty combo! That bunny is so sweet! I love him!